A training partner and protégé of Bruce Lee, he was brought on by Bob Ward, a college friend who had taken lessons from Inosanto in the past and was the team’s conditioning coach. Ward saw the potential benefits of martial arts training, especially for the team’s defensive line. Other coaches — and Inosanto himself — were skeptical. A former football player, Inosanto helped coach the Cowboys using techniques culled from a variety of disciplines, including wing chun and hubad hand drills from Filipino martial arts. His role in helping to train what would become the second generation of the Cowboy’s Super Bowl-winning “Doomsday Defense” will be the subject of an upcoming movie, which does not yet have a release date. “I thought, ‘Yeah, this would be really good for the linemen,’” said Inosanto. One of the defensive lineman who benefited was Randy White, then a newcomer to the Cowboys — and to martial arts. But from the onset, White, a Pro Football Hall of Famer and Super Bowl co-MVP, said he could see how Inosanto’s training could help his finesse on the field. 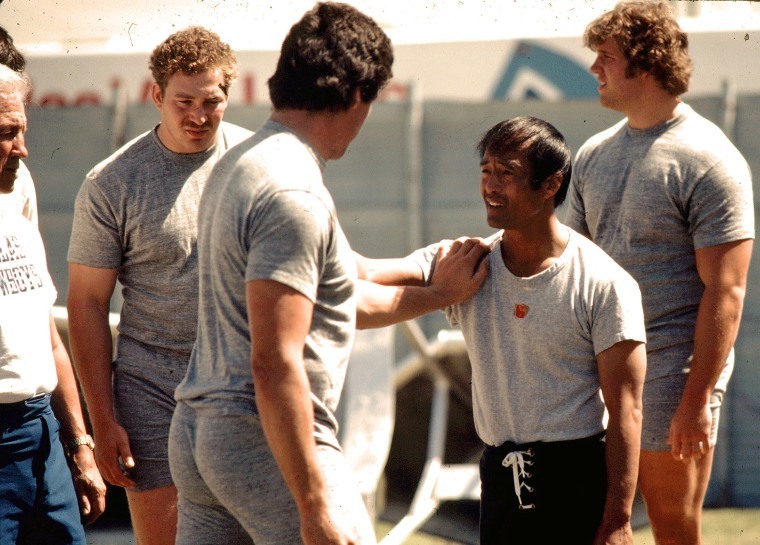 The Cowboys went on to win the 1978 Super Bowl and some credit Inosanto’s influence for their improved performance leading up to the championship. The film will be produced by Inosanto’s daughter — Diana Lee Inosanto — and Mark Gordon (“Saving Private Ryan,” “War Dogs”). Diana Inosanto has spearheaded the development of the project for the past decade. “I always thought people should know my dad’s responsibility for being the first man to introduce martial arts into the NFL and how it was secretly used,” she said. It’s also a story about making unorthodox choices for a conventional sport, she noted. Today, martial arts training is a part of some pro football teams’ training programs. In addition to producing the film, Inosanto is writing a book about her experience growing up in a storied martial arts family and as Bruce Lee’s god-daughter. The stuntwoman, actor, and filmmaker started learning martial arts at age 2 and would often join the predominantly male classes taught by her father. Inosanto recalled seeing celebrities like Steve McQueen, James Coburn, and Kareem Abdul-Jabbar train with her father and “Uncle Bruce” as she was growing up. In the 1960s and 1970s, when most martial artists only practiced within one discipline, Lee and Dan Inosanto proved groundbreaking — and controversial — in the way they studied and melded various styles, Diana Inosanto said. Jeet Kune Do, which was invented by Lee and taught by Inosanto, is often credited with paving the way for modern MMA. But one of Inosanto’s favorite memories of Lee is only tangentially related to martial arts. Hollywood depictions of martial arts are often a mixed bag, he said. “I think a good martial arts picture is not just about the martial arts, but where it’s just highlighted. I think that’s the best way to portray it,” Inosanto said. As for who will play him on the big screen, he said hasn’t given it much thought yet. Diana Inosanto said names like Bruno Mars and Vincent Rodriguez III (“Crazy Ex-Girlfriend”) have been floated, although no casting decisions have been made. “I’m like water. I go with the flow,” Dan Inosanto said, referencing Lee’s famous words. Inosanto continues to teach around the world — traveling 42 weeks out of the year, he said — and at the Inosanto Academy in Southern California. He said he feels a responsibility to spread his love of martial arts and of Lee’s legacy, one that is intertwined with his own. And even in his 80s, he has no plans of stopping any time soon.